This had been my all time favourite lotion. I think it's my 5th bottle so far. The Aloe Vera is one of my favourite scent. My body skin always had been dry, as I never really reached for body lotions 2 years ago, I found them pointless, big mistake. Now I can't leave without them. I do like to have few at one time, as I don't always feel like I want to smell the same, so I switch to others too. 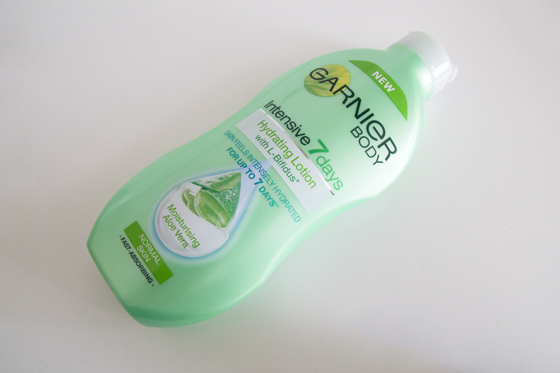 The Garnier lotion is the one which I will always go back to. The smell last on my skin for most of the day, I would give it a good six hours. The smell is very fresh and not sweet (I'm not a fan of sweet smelling body lotions). It's absorbs to the skin super fast and it doesn't leave it sticky, as some of the lotion does. It's very watery form of cream. Very hydrating for the skin. I tried the Gel version of this, but I must say that I don't like it, the smell only last up to an hour. This version is amazing! I always take it with me on my summer holiday. The 250ml bottle last for around 1 month time, with everyday using. My skin is now normal (although my skin gets very dry during winter). When it's comes to body care I normally go for high street products as I think they are really good. Ooh this sounds very nice, and I have quite dry skin so i'm going to have to grab myself a bottle. I have never tried a body lotion before, I'm not to sure if they sell this in New Zealand I will have to hunt it down.